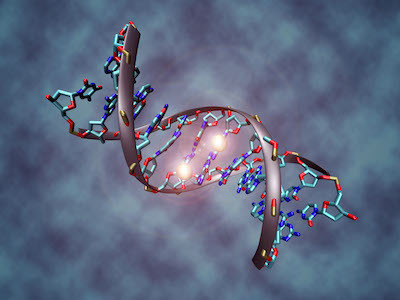 Translating innovations from regenerative medicine to hair care. 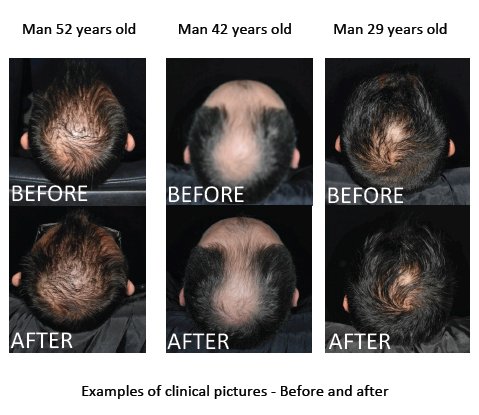 Redensyl is the newest breakthrough against hair loss and the best alternative to hair transplantation. It is the first hair care cosmetic active ingredient based on regenerative medicine researches and can give better results than a surgical procedure for hair transplant in 84 days. The human scalp has an average 110,000 hairs which are growing and falling on a daily basis. When the balance between the growing hairs and the falling ones is altered, hair loss starts and baldness occurs. Hair loss (also called alopecia) can happen at any age, mainly targeting men. It is a known fact that 40% of the men will have noticeable hair loss by age 35, this number reaches 65% by 60 years of age. Women are also deeply impacted by such process: 50-75% of them suffer noticeable hair loss by age 65. Hair loss can be devastating for a person's self image and emotional well being. According to the International Society of Hair Restoration Surgery, almost 1 million patients worldwide were treated by surgical and non-surgical hair restoration means in 2012. 93% of the hair restoration surgery procedures achieved in 2012 were targeting scalp, and 4.5% eyebrows. Men represent 86% of the patients for hair transplant surgery and 67% for non-surgical hair restoration. They initiate such treatment at the average age of 38. Each hair surgery enables the transition of 2016 grafts, representing about 8,100 hairs transplanted on patients' scalp. 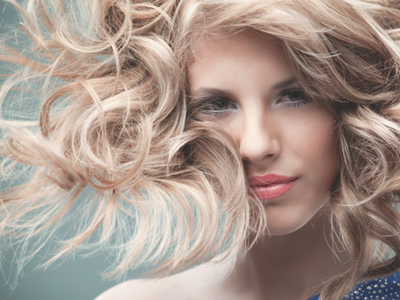 Patients spend an average of $6,200 for one hair surgery procedure and generally a minimum of three procedures is required to restore the appropriate hair density. Data shows that 64% of the patients' post-surgery complaints are about the final density of their hair. Since stem cells are now a major focus area and trend in the scientific community, with incredible application promises for regenerative medicine, the research on hair follicle stem cells are more recent. However, 40% of the scientific articles related to this topic in PubMed have been published over the last three years, showing the high level of R&D labs in this direction. Activation of hair follicle stem cells and management of their differentiation to induce the production of new hair, has become the Holy Grail to answer the needs of the world-­‐wide hair loss sufferers who are seeking professional treatments. 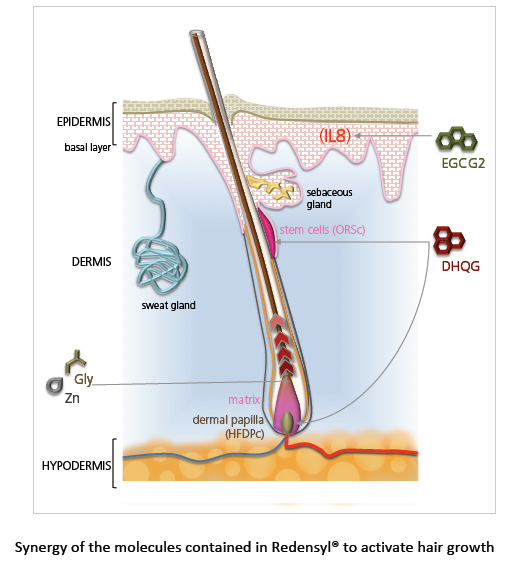 Induchem's biotechnology center analysed the role of the bulge stem cells (ORSc) in the hair growth cycle and learned that ORSc have a crucial function in the initiation of the anagen phase, which is the growth phase of the hair. They discovered that a new molecule: dihydroquercetin-­glucoside (DHQG), a modified polyphenol from larches tree, is able to activate the division of ORSc, while maintaining their differentiation properties (cytokeratin 15 activation). DHQG also showed its capability to protect these cells from apoptosis (BCL2 activation) and to drive them towards the anagen cycle (β-­‐catenin activation), while boosting the metabolism of dermal papilla fibroblasts (HFPDc cells). Its action is reinforced by the presence of EGCG-­‐glucoside (a biotech derivative of the green tea EGCG) to reduce the typical inflammation (interleukin-­‐8) of alopecic scalp. These biological activators (DHQG and EGCG2) have been combined with glycine (Gly: a key amino acid of hair) and zinc (Zn: an activator of cystin incorporation in keratin) to favour the hair growth metabolism. The first test on alopecic hair in the reference Philpott assay have shown that Redensyl gives scores almost two times superior than the worldwide reference Minoxidil, boosting the hair growth. Redensyl has been exhaustively evaluated during a double blind versus placebo clinical trial on volunteers showing grade three to four alopecia according to the medical Norwood classification. 85% of the volunteers had significant and visible hair growth with up to over 28,200 new hairs obtained in 84 days, ie the equivalent of three full procedures of hair transplant surgery. 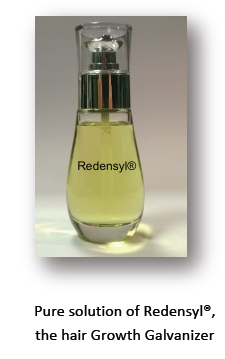 Redensyl is the result of a patented green chemistry process (organic solvent free glycosylation) which enables the synthesis of DHQG and EGCG2, the stable and soluble derivatives of dihydroquercetin and EGCG. This process avoids the use of high amounts of energy, reduces the number of steps and the use of hazardous chemicals that would have been required in a traditional organic synthesis production process. Most of the existing hair growth ingredients available on the market for the cosmetic industry are plant extracts or peptides. 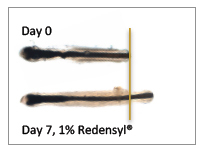 On the contrary, Redensyl represents a new generation of hair growth activating molecule. It has been designed from the rational analysis of the stem cells function in hair follicles and is the result of a unique patented synthesis process (an organic solvent free enzymatic glycosylation process). The unique mode of action (ORSc stem cells activation, stimulation of the HFDPc papilla dermal fibroblasts, reduction of inflammation) ends up in a fast and sustainable production of new healthy hair on volunteers suffering from androgenic alopecia in three months. Redensyl is a biotechnology ACI (Active Cosmetic Ingredient), with a purity over 97%, and is the cosmetic equivalent of the API (Active Pharmaceutical Ingredients) from the pharma industries. Redensyl has a nice-­looking golden-yellow colour, but does not impact the colour of formula. 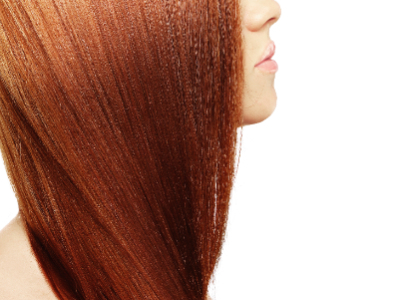 Preservative free and odourless, Redensyl is compatible with alcohol for hair care lotions. Redensyl enables to create new generation of anti-­ageing hair care products for the manufacturers, as well as eyelash growth boosting formula and eyebrow restoration products. This ingredient is water soluble, easy to formulate in any typical hair care formula and can even be used in hair sprays.